PIDG’s vision is enhanced provision of affordable and sustainable infrastructure services in low-income countries and FCAS in order to combat poverty and help economies grow. Financing for these projects should be increasingly sourced through local capital and credit markets; building capacity and resilience in frontier markets. PIDG’s mission is to operate at the frontier of infrastructure development in low-income countries and FCAS to combat poverty. We provide leadership, development capability, funding and finance solutions across the project cycle to support infrastructure provision that results in high development impact and develops local capacity and capability and the financing potential of local credit and capital markets. 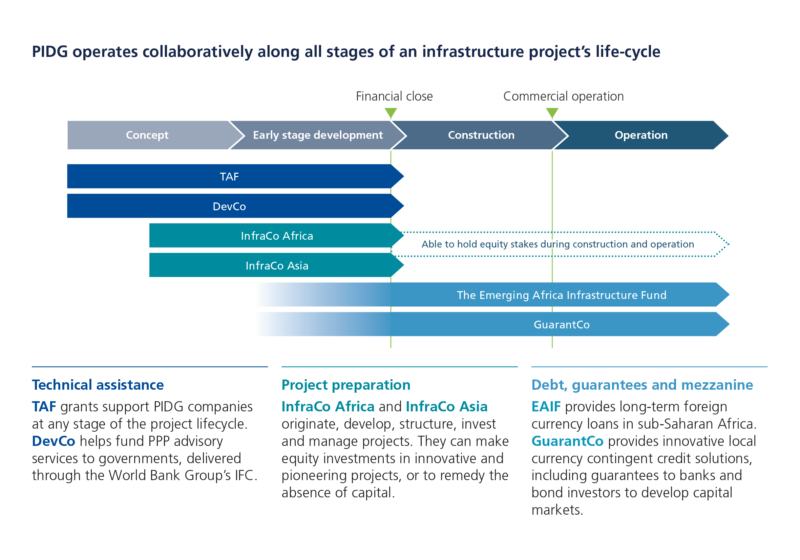 PIDG operates along the project life cycle and across the capital structure, to help projects overcome financial, technical or environmental challenges – creating investment-ready, bankable infrastructure opportunities. PIDG was established to address a series of market failures. Funded by six governments and the IFC and with an unwavering focus on pioneering infrastructure in the poorest and most fragile countries, it creates impact by doing what others cannot or will not do. Focused solely on infrastructure, PIDG plays a critical role in underpinning economic growth and improvements in people’s lives. PIDG utilises its public-private partnership business model to catalyse private sector investment in infrastructure where it is needed most. PIDG’s pioneering approach has seen significant success. PIDG is now a sizeable organisation, drawing on over $3bn of funding and with a 16-year track record of leveraged funding: $33.7bn has been invested by private sector investors and development finance institutions alongside PIDG’s $3.2bn commitment to infrastructure projects. For each $1 of PIDG funding, projects it has supported have mobilised $23, of which $17 comes from the private sector. So far, PIDG has delivered accessible, reliable and sustainable infrastructure across 170 projects, creating more than 240,000 long-term jobs and providing 231 million people with access to new or improved infrastructure.